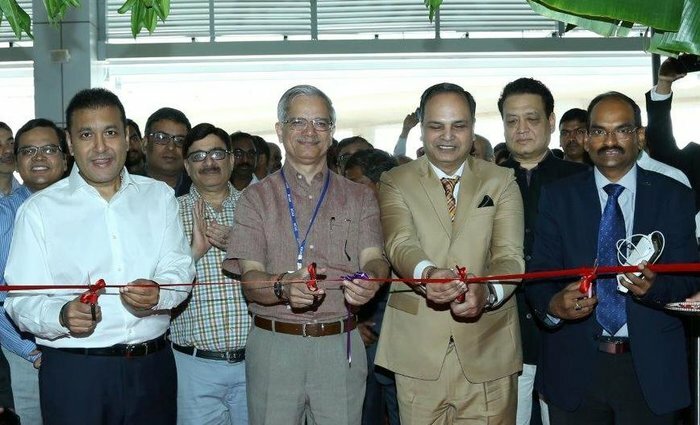 Officials at GMR Hyderabad International Airport (GHIAL) have inaugurated its interim international departures terminal, which is to begin operation on October 23. The terminal has been designed to cater to the continued growth in passenger traffic. The interim international departures terminal is an exclusive concourse to handle check-in, security, immigration, customs processes. After completing these formalities, passengers will move into the main passenger terminal building using a bank of elevators and an escalator, where they will be able to enjoy passenger amenities including shopping, retail, food and beverages, and lounge access. The new departures terminal is equipped with a host of new technologies including India’s first ever remote hand baggage-screening facility, which – when coupled with the new automatic tray retrieval system (ATRS) – can offer up to double the passenger throughput at security checkpoints, cutting wait times and enhancing the passenger experience. Recognizing Hyderabad’s increasing prominence as a leading global business and investment destination, the interim international departures terminal will also offer a premium check-in facility where passengers travelling first and business class can experience a separate, personalized and assisted check-in process in a comfortable setting. The terminal will also offer dedicated immigration and security counters to serve first and business class passengers. Coinciding with the opening of the new terminal, the Hyderabad Duty Free (HDF) store at the departure level has been relocated and upgraded to offer an enhanced shopping experience to the passengers. Speaking on this occasion, GBS Raju, business chairman – airports, GMR Group, said, “Hyderabad Airport has witnessed impressive growth, with the total traffic more than doubling over the past four years. SGK Kishore, CEO at GHIAL, commented, “Our city is witnessing a boom in air travel and with its strategic locational advantage, the passenger traffic through Hyderabad Airport is growing at a rate of about 24% YoY. Currently, 22 airlines operate international flights from Hyderabad International Airport. The hub handles more than 5,500 international departing passengers and 32 international flight departures daily, connecting to 29 global destinations. The exclusive interim international departures terminal facility is located close to the Haj Terminal facility, and is adjacent to the international pier of the main passenger terminal building.